This next kitchen essential may surprise you. Every real food kitchen needs butter! I know what you're thinking, didn't I say to get rid of butter in yesterday's post? Yes, conventional butter such as land O'lakes, Betty Crocker, and store brands need to get out of your kitchen. But grass fed butter needs to be a staple. And once you have grass fed butter you won't go back! The best butter to have in your real food kitchen is raw grass fed butter. I love to make it myself when I can get my hands on some raw cream. It's actually very easy to make. I share how to make it in this post. If I can't get raw cream my favorite butter to use is the one in the picture above. The color is a rich golden yellow and it smells divine. 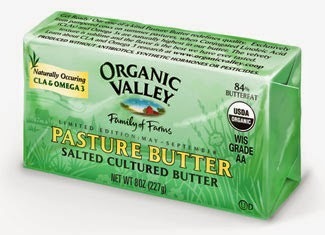 Organic Valley only makes a small batch of this butter and it's only available certain times of the year. If you can't get this brand, Kerrygold is another great brand. When you are shopping you want the butter to be organic and grass fed. Here is a wonderful article sharing all the health BENEFITS of grass fed butter. YES, if you are eating the right type of butter it can actually be healthy for you. I like to use butter in recipes such as fettuccine alfredo. (we use quinoa noodles..a post coming on that as well) I don't use butter very often because I like to use a lot of coconut oil but it still an essential part of our kitchen. I enjoyed the ghee I made with grass fed butter when I was doing the Whole 30 earlier this year! Great series!